Healthy Together is a quarterly publication focusing on a specific community health issue and the responsive initiatives that are making our region stronger, healthier and more equitable. Food insecurity, or “the limited or uncertain availability of nutritionally adequate foods,” is considered to be a powerful economic and social indicator of community health, and is associated with chronic health problems including diabetes, heart disease, and mental health issues. So what does food insecurity data tell us about the health of the Western Suburbs, and how are local partners responding to fulfill an ever-growing need for nutritional assistance? In Cook County, more than 1 in 10 people (12.6%) experienced food insecurity at some point during the year. 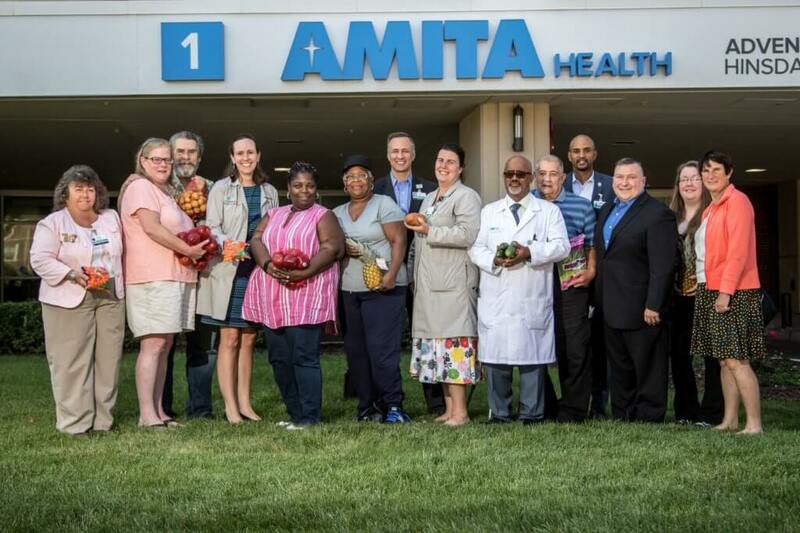 Northern Illinois Food Bank is partnering with Community Memorial Foundation and AMITA Hinsdale Hospital Family Medicine Center to provide boxes of fresh produce to food-insecure patients. As part of the pilot program, residents screen patients through a series of questions developed by the USDA; those who identify as food-insecure are offered a Healthy Harvest produce box and are invited to return as needed. The Food Bank anticipates distributing an average of 75 boxes/week, serving 300 CMF residents. Since 2013, The Foundation has partnered with the Township of Lyons to leverage support for 12 mobile food pantries. This year, the Foundation, the Township, and the Greater Chicago Food Depository are partnering to host a total of 15 mobile pantries that will address increased need in the communities of Summit, Lyons, Justice and Hodgkins. On average, residents in these four municipalities experience substantially higher rates of food insecurity than others in suburban Cook County, as measured by household incomes below 185 percent of the federal poverty line. Hunger continues to be a challenge in many households, especially in Willowbrook Corner, an area identified through PRAN (Proximity to Resources and Need) mapping as one of the highest areas of need in DuPage County. Facilitated in partnership with West Suburban Community Pantry and Northern Illinois Food Bank, this mobile pantry serves 600 local residents at each of the 12 distribution events. The school-based pantry at Anne M. Jeans Elementary School was first opened in 2016, and is one of only three school-based pantries in Illinois. The pantry serves Willowbrook and surrounding communities, where roughly half of all households with children receive SNAP assistance. In the past, the pantry has only been open to families enrolled in Burr Ridge Community Consolidated School District 180, but with the recent completion of the school’s new community center, the pantry has expanded 50% and will now be open to the public. HCS Family Services anticipates serving 1,200 families with the Foundation’s recent grant in support of the program. People’s Resource Center operates one of the highest-volume food pantries in DuPage County, distributing over 700,000 pounds of food from their Westmont facility. On average, the PRC-SE food pantry serves over 960 households every month, and families receive approximately $140 worth of food per visit. Since 2000, Community Memorial Foundation has supported St. Blase Center with traditional housing and basic needs services. 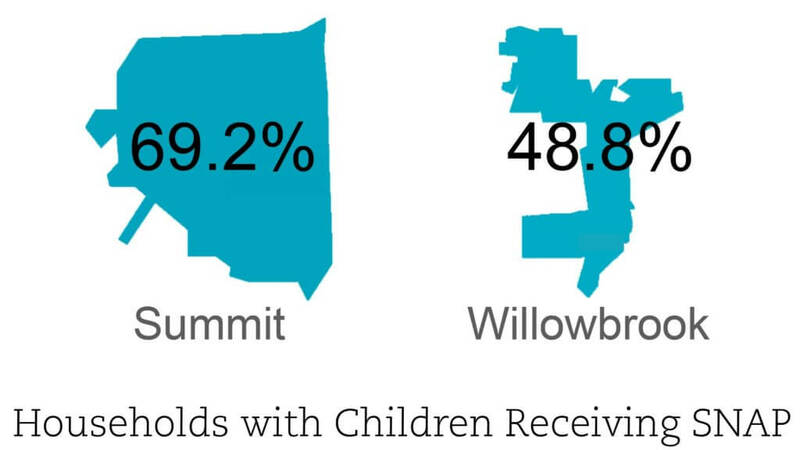 Despite the fact that nearly 70% of households with children living in Summit receive SNAP assistance, there are no other permanent food pantries located in Summit. Our most recent grant will support the growing need for three of the Center’s programs: a weekly Evening Supper Program for the hungry and/or homeless; an emergency assistance food pantry; and a distribution site for the Commodity Supplemental Food Program for seniors, mothers and children. Together, these community initiatives have a major impact on addressing basic needs and the social determinants of health. 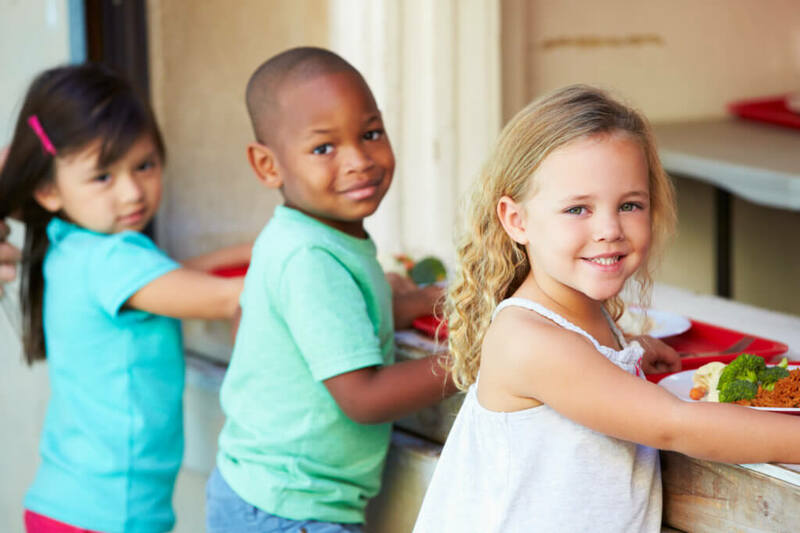 We invite you to visit the Foundation’s data dashboard to learn more about food insecurity in our region, and review promising practices and funding opportunities related to various health indicators.